We are proud to announce the fourth annual Eternal Central Old School 93-94 tournament at Eternal Weekend. This year’s Eternal Weekend is being held in Pittsburgh, Pennsylvania (USA). The Eternal Central Old School 93-94 tournament will be held on Thursday, October 19 2017, at 11am, and will be a charity event to raise funds for Cornerstone Community Outreach Program. – The Eternal Central Old School 93-94 tournament will be held on Thursday, October 19 2017, at 11am (we will open earlier for deck reg and card signing; plan on showing up a little early). – Tournament structure and length will be SWISS PLUS 1. 65-128 players normally calls for 7 rounds, while 129+ players would call for 8 rounds, so this will either be 7+1 or 8+1 timed 50 minute rounds of Swiss, depending on turnout. Our goal is to start early enough and playing quickly enough to be able to get out to relax and get rested up for Vintage Champs the next day (or to let people out early enough to do their own thing). There will be no draws allowed, and at the end of 50 minutes if there is a tied match both players will do a sudden death Chaos Orb flipping contest (complete details in our Old School 93-94 rules here). This is to keep the pace of play and keep the day going more smoothly than last year. Play a fun deck, imbibe, and have a blast with friends new and old! – The Eternal Central Old School 93-94 tournament will observe the Banned & Restricted List found in the rules on the EC Old School 93-94 rules page here. This page always has a complete list of deck construction rules, sets allowed, errata, and the most up to date Banned & Restricted List. – Decklists are required for this event, and by decklists we mean a clear photo of your deck + sideboard. Please send all decklist photos to decklists@eternalcentral.com before the event begins. – The official hashtag on Twitter and Facebook for this event will be #ECOldSchool2017, so please use that when snapping pics and updates from the event. – Prizes will again be awarded by Eternal Central, and will be Old School cards in flavor and nature, Alpha through Fallen Empires. As usual, this is a tournament for fun, and not ‘EV,’ and these will not pay off your monthly bills. – Tournament prizes will be done a bit differently this year than in the past, as will be awarding fewer prizes for tournament finish, and more prizes for Most Creative Deck. The Most Creative Deck category will focus on players who focus on the fun and creative aspects of deckbuilding. This award category began this last year, and will be a growing and recurring theme of EC-sponsored Old School events going forward. – In addition to any other prize cards, the player with the BEST RECORD (ie. 1st Place after Swiss+1 rounds) will also be awarded a slot and free entry in the prestigious Fishliver Oil Cup, held annually in the fall, in Italy. This is an Old School 93-94 event with limited seating, that uses the Swedish 93-94 B&R rules, “Italian style” (allowing for more permissive reprints than the Swedes), and attracts many of the most devoted players in Europe. The organizers of the Fishliver Oil Cup have also extended an extremely generous offer of $500 to help cover costs of airfare from USA to Italy, as well as 2 nights paid for in a local hotel, for the 2018 Fishliver Oil Cup. Amazing! 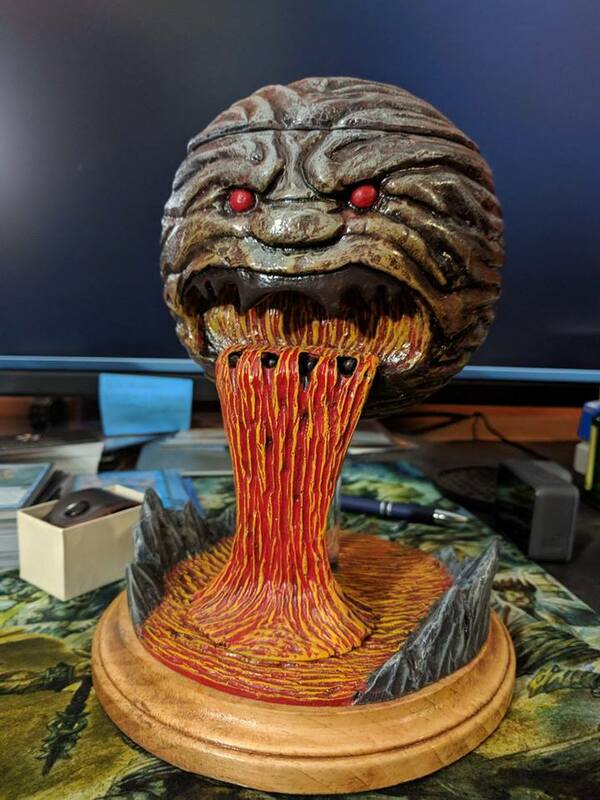 – In addition to any other prize cards, the player with the MOST CREATIVE DECK will also be awarded this trophy – a custom made deck box featuring Chaos Orb. This is meticulously hand-crafted by the fine folks at Leifkicker.com, and graciously donated by community member Matt Dennis. Feast your eyes on this beauty! – Entry fee will be a non-refundable $25 this year, in order to cover the costs of renting a larger venue (and some additional supplies and surpises), and the remaining amount collected to be donated to charity. This tournament is open to all participants 21+ years of age, but you must preregister using this ticket checkout. This year’s event will have a hard cap of 180 players due to venue space, so if you plan to attend, please get pre-registered ASAP to reserve your space. – Please be respectful of the venue, the cards, and the people around you, or you will be asked to leave (and unwelcome at future events).